Features & Specifications :Output Contact : 2 C/O (DPDT)Range : 60s-60secOperating Mode : True p.. Features & Specifications :True RMS measurement, For 1 phase 2 wire Electrical network,CT primar.. Features & Specifications :Supply voltage : 100-240V AC, Pulse OutputDisplay Type : LCD with bac.. Features & Specifications :Din Rail On Delay / Interval Timer, 12 RangesOn Delay / IntervalLED s.. 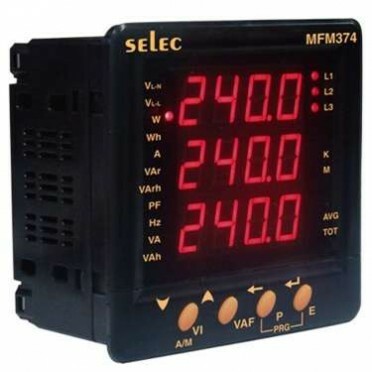 Features :Micro Controller based 3 Channel DC Energy Meter.Displays DC parameters V, I, KW, KWh ,MWh.. Features :Display : Three Display, 7 Segment, 4 digit, 0.56” RED LED displayInput Type : 3Ø, 4 WireV.. Description :If a system requires a single control loop or discrete devices then a single loop contr..